A few days ago, I received a really nice compliment from a reviewer with the Farm Credit Bureau. I had completed a complex appraisal assignment and was expecting multiple revision requests, but instead, got a note saying how thorough my appraisal report was and thanking me for the work. A couple days later, I got a call from a relocation company reviewer on another mind-boggling relocation assignment. Again, I was expecting multiple questions about the report since it was complex and atypical for the area. Instead this reviewer proceeded to tell me that it was one of the most detailed and well-developed reports he had seen in all his years reviewing relocation work. Boy I wish I had that one in writing! Granted, I tend to be a bit verbose because I like to write, and I believe that it is important that my work be understandable, and not just now but in the future. I tend to put a similar amount of effort into the communication side for all clients, and like to think that my work product is solid. This begs the question of why two reviewers went out of their way to compliment my work, when it seems that almost every mortgage assignment that I complete for a production group, comes back with stipulations. Stipulations that I forgot to add a listing which was a requirement of the engagement agreement (yes, I missed that) or that I didn’t put a sketch of an unfinished basement in the report (yes, I missed that as well). No words of thank you for an otherwise job well done. I missed something, fix it. I fixed it quickly and both reports closed out quickly through the system, but I felt foolish and unappreciated. No doubt I earned some “black marks” against me for “poor quality” because the reviewer had to come back for a “correction.” These stipulations are almost always about a lender overlay, not a Fannie Mae or Freddie Mac requirement. They are rarely anything that affects the quality of the report, but do affect my ranking with the lender client, since a revision was needed. Having spent many years as a reviewer dealing with post-funding issues (quite often buy-backs from the GSEs), I completely understand why lenders end up with overlays above and beyond the Fannie Mae/Freddie Mac requirements. However, I have never seen a buy-back due to an appraisal lacking a listing on a stable market appraisal, nor one because there was a lack of a sketch of an unfinished basement. 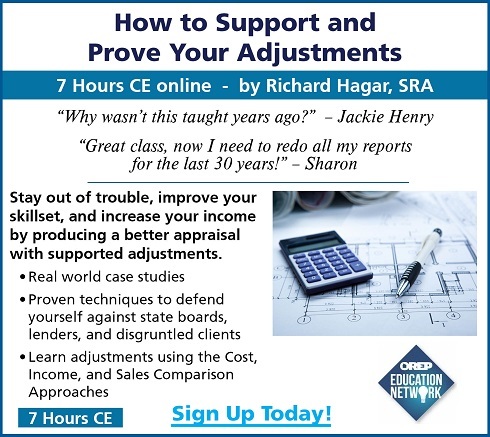 These types of stipulations are wasting time and resources for both the appraiser and the lender client but this is a topic for another story. My question here is, was the work quality that caused positive feedback from a couple of reviewers truly different than the quality that engendered stipulations? Probably not. I did make a mistake on my two mortgage assignments related to including a listing in a stable market, and not including a sketch of an unfinished basement. Both of these were in the engagement agreements that I received, and both agreements were “scanned” by me as opposed to read with my red pen in hand. Each assignment was completed with care and with attention to communicating the results in a clear and understandable manner but two parties appreciated the efforts and the other two were seemingly only concerned that all of their checklist items were met. I have no idea if the other two mortgage assignments were read by a human being, or simply run through a checklist review. Reviewers- why does this even matter? Does it matter? As someone who tries to always deliver the best work, it does to me. The reviewers who went out of their way to reach out in a positive way made my day. 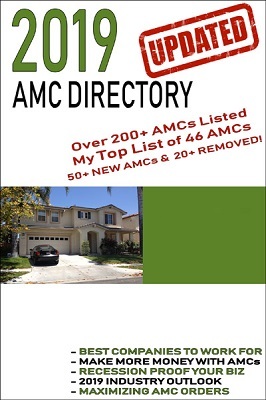 The reviews who came back with stipulations made me realize that I am going to have to bullet point each lender requirement much more carefully going forward so that I do not get a stipulation on something that I know is not required by Fannie Mae or Freddie Mac, but a separate lender overlay. I am going to continue to put in the effort to do my best regardless of whether I receive a compliment or a stipulation, but as I eventually become busier, I will concentrate my efforts on the work for the clients who care, and do less and less for those who are only looking for minimum criterion of checklist items. In case you believe I am alone, I asked a couple questions through Survey Monkey (limited to 100 responses) to gauge sentiment among other appraisers. 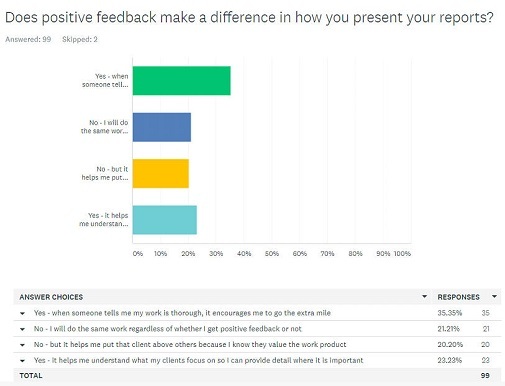 The first question was whether positive feedback makes a difference in presentation: 58 out of 99 responses indicated that it does make a difference. 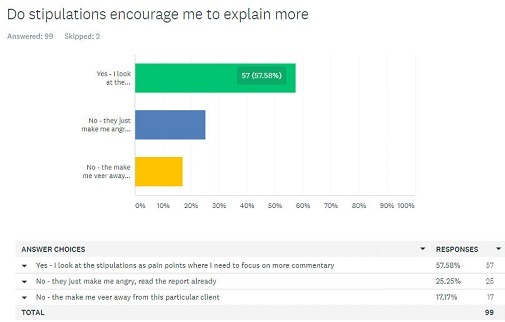 Only 21% of the respondents said they would do the same work regardless of feedback, and another 20% indicated they would put the client who provided positive feedback above others. The responses follow. The next question that I asked related to whether stipulations encourage the appraiser to explain more or not. This was a “Yes” or “No” answer. The “Yes” answer received over 57% of the votes, as a place where the appraiser could concentrate their verbiage, as stipulations can help us understand our clients needs better. The other two responses are that it just makes the appraiser angry, and less likely to work with that client in the future. Having spent time as a reviewer, I do understand that often appraisers overlook adding commentary which would be helpful in providing a better supported report. I understand how important the role of the reviewer is in ensuring his/her employer receive a supportable and defensible report. Having spent most of this time dealing with post-funding issues, I cared about the larger picture, not the small details such as an unfinished basement sketch. I cared whether the appraisal addressed adverse locational issues, or whether comparable sales included were remodeled, when the subject property was a time-piece to the 1970s but had the exact same ratings. I cared about whether the report provided support for market conditions adjustments, or lack thereof. Some appraisal reports that I have seen as a reviewer have been very well developed and communicated. Some, not so much. Some of the best reports I have had the pleasure of reading scored very high risk on the CU scale, but it related to complexity, and the appraiser spent sufficient time explaining the issues as well as their analysis and conclusions. Some of the weakest reports I have seen scored very low on the CU scale, but had serious omissions. Those omissions were not items such as sketches of unfinished basements. By the way, the relocation reviewer did have a couple questions, which I was able to answer promptly. His questions were respectful, and his tone that of one professional to another. I was happy to answer them and appreciated the opportunity to flesh something out a bit more fully (related to an easement that I noted in the report which was not picked up by the other appraiser). There are right ways to ask questions, and wrong ways. Keep in mind the saying of attracting more flies with honey than vinegar. Appraisers are far from stupid. We know when we have done work that rises to the level of a job well done. We also know when we have done the bare minimum. For the lenders and reviewers who are reading this piece, when you see work that is truly solid and well communicated, say something. Instead of only providing feedback when something is missing, provide some feedback for an appraiser who has gone out of their way to do work that exceeds expectations. Chances are that you will make someone’s day, but chances are, you will also encourage the appraiser to put your company ahead of others. For those reviewers who nit-pick, ask yourself whether you are discouraging appraisers from working with your employer. Does a sketch of an unfinished basement rise to the level of a stipulation for correction? Is Fannie Mae or Freddie Mac going to send a demand letter for repurchasing the loan because there is no basement sketch? Not likely! Reviewers: if the work is good, say so. If it needs improvements, some constructive feedback works well. If our work is below par, ask questions which encourage us to provide more detail in our reports. 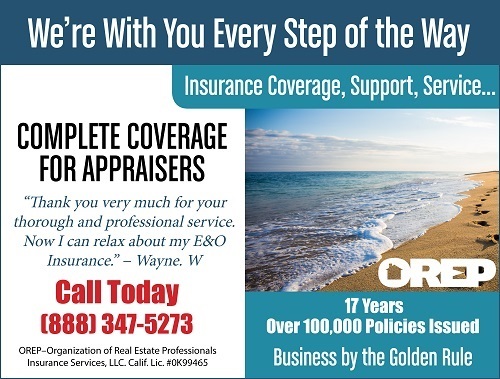 Treat appraisers as the professionals we aspire to be, and watch appraisers exceed all expectations. Rachel, this was a great article. I appreciate your thoughts, and you’re right, positive feedback is usually slim to none and I have always believed in using “honey”. “Back in the day” I would send thank you notes to the sales agent on site for new construction after they provided me with information that I needed and gave me some of their time. It would be nice to go back to seeing more kindness and educating, rather than demands from some unknown individual. Today many appraisers doing mortgage work, don’t even know their clients, secretaries, processors, reviewers, etc. I hope the tide will change. Again, thanks for reminding me that appraiser’s are human. Great article Rachel! Thanks for taking the time to share such a positive outlook. I have always appreciated your perspective, advice and writing style. 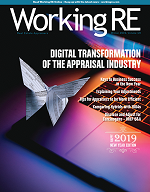 I fully agree that we can never compliment appraisers enough for their quality, hard work, cooperation and understanding as they are being asked to jump through so many hoops.